IT Administrators and Technology Coordinators that are responsible for the integrity and performance of their organization's networks. Simple, low-cost one-way messaging and alerting tool that enables an administrator to communicate instantly with desktop users across any size or type of organization. 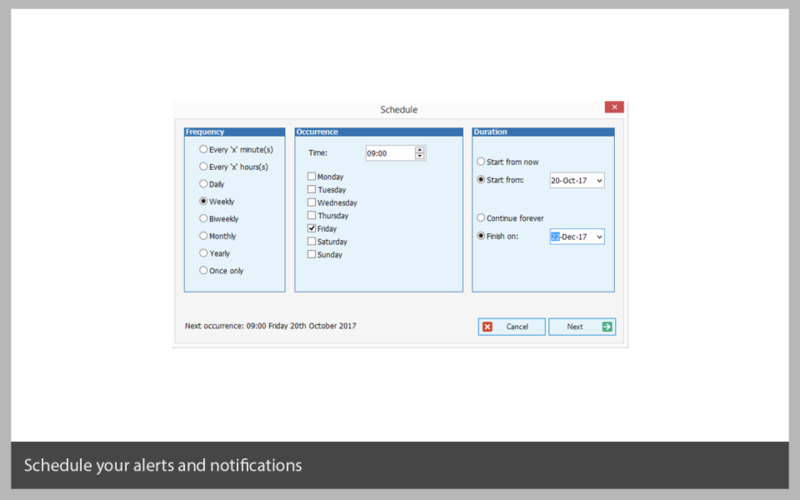 Send routine notifications or urgent alerts to selected or all desktops (Windows, Mac or Linux) or large information panels from a Windows PC or Android/Apple iOS device. 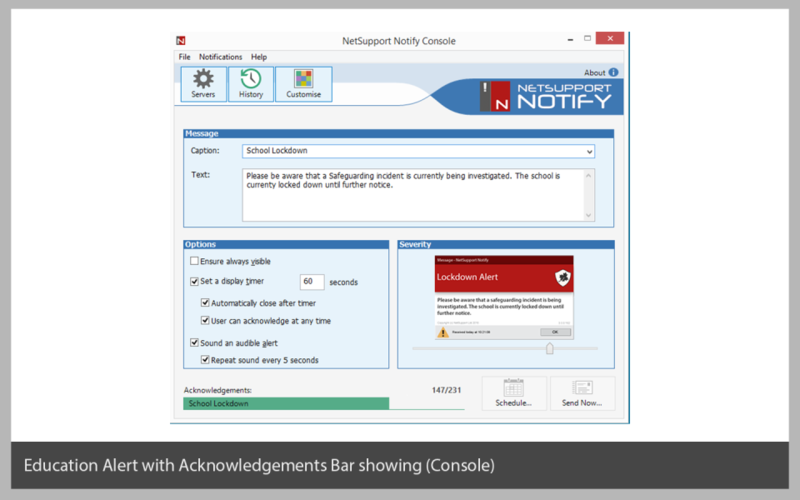 Unlike typical LAN-based messaging solutions, NetSupport Notify provides a dedicated local notification gateway(s) that allows seamless message delivery. 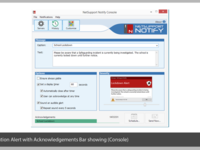 NetSupport Notify Reviews Recently Reviewed! 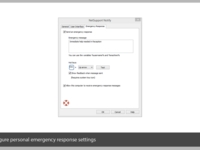 Overall: I use this software mainly for the Emergency alert features, although as an IT guy the messaging features are good when I need to run maintenance or need users to reboot their PCs. Deployment is a breeze with the discovery process that Netsupport Notify comes with. The Emergency Alert feature is a great one this day and age where active shooter incidents seem to happen more frequently. Its a great way to alert everyone at once of an emergency. Exactly the product we needed at a great price! Pros: We are able to push instant desktop notices to all of our users across 8 remote facilities with no effort. 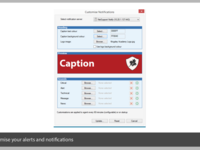 The NetSupport Notify product also has the option to force the end user to view the notice by defining a minimum amount of time before a user can acknowledge the alert to make it go away. The software also shows who has read and acknowledged the alert from the central admin console and even gives us the ability to brand the pop-up notice with our own logo. Cons: Wish we would have found the software years ago as we used to rely on email notifications and overhead paging. A rare product that "just works"
Pros: The ease of use and simplicity of the interface are my top "pros". It was also relatively easy to set up from an administrative standpoint and integrates well with other NetSupport products. Cons: My only complaint is configuration management -- It can be hard to keep track of who you've deployed specific configurations to and what is unique to each configuration, but as long as you pay attention to what you're doing it should be no issue. 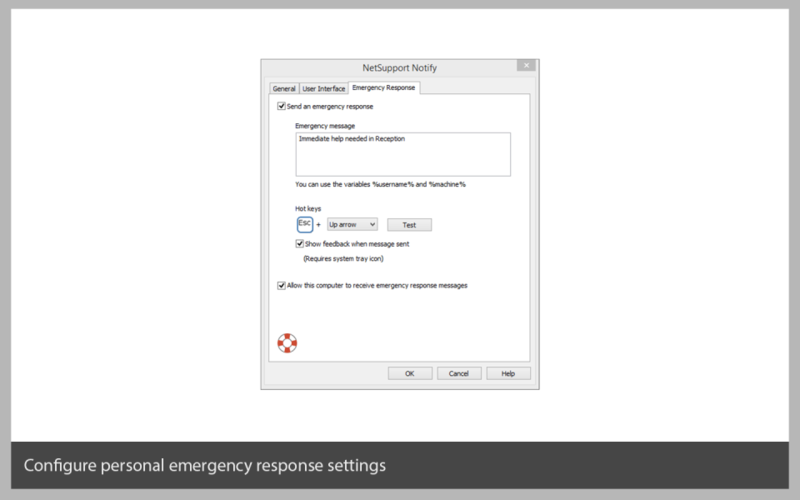 Overall: E-Mail is not always a great way to communicate issues -- there are times when you need a more urgent response, and NetSupport Notify gave us just that. Great product! We have been using it for 9 years and have never considered another product. Pros: The software does what it is supposed to do, notify. I is extremely easy to rollout to client computers. The interface is very easy to use. It has great tracking so you can know who has seen your message. Finally, it is very inexpensive. Cons: There really isn't anything I don't like about this software. I suppose the process of moving the installation to a new computer had a few hiccups but nothing substantial. Cons: no working/notification of message character limit - we have created messages and sent them to then only see that the entire message is not displayed. so we have learned to be short & specific but some warning or better display of the actual message that will be sent would be beneficial. Overall: instant communications displayed on user's system screens regardless of a user being logged in to convey some sort of system issue, status, upcoming outage, etc. Pros: Helps us give alerts to our sales team when a call comes in. Cons: No issues to report. Software works great. Great piece of software, never had any problems with it, always ready when we use it. Pros: Ease of use, open the software type in your notice select the users and off it goes. Invaluable piece of software to keep users informed of important notices or events. Cons: Would really like a bigger text box on the notice that goes out so users do not have to scroll and more characters to work with. Excellent response to customer needs. Product has been extremely useful in emergency situations. Pros: Quick and easy use to notify our staff of problems. I have recommended the software to many colleagues. 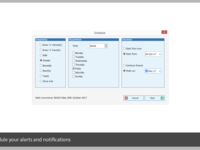 Overall: Easy, quick and accurate notification to our staff related to emergency situations on their desk top. 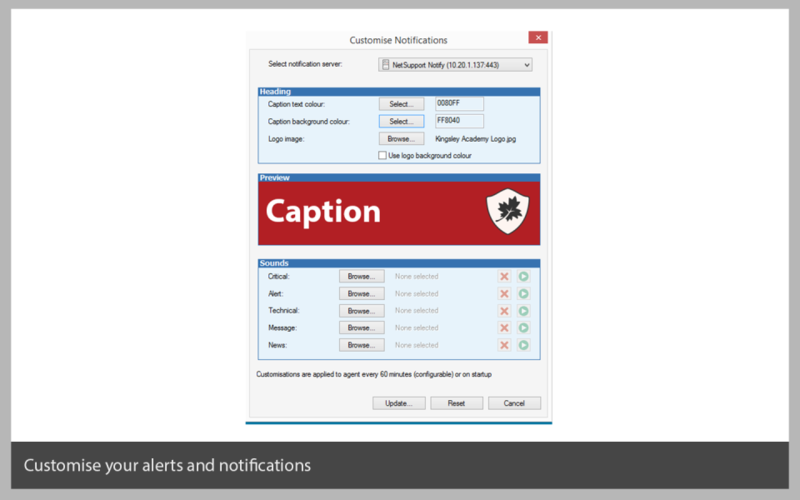 Excellent software for pushing critical notifications out to staff. Pros: Low resource demands, easily integrate into Active Directory. 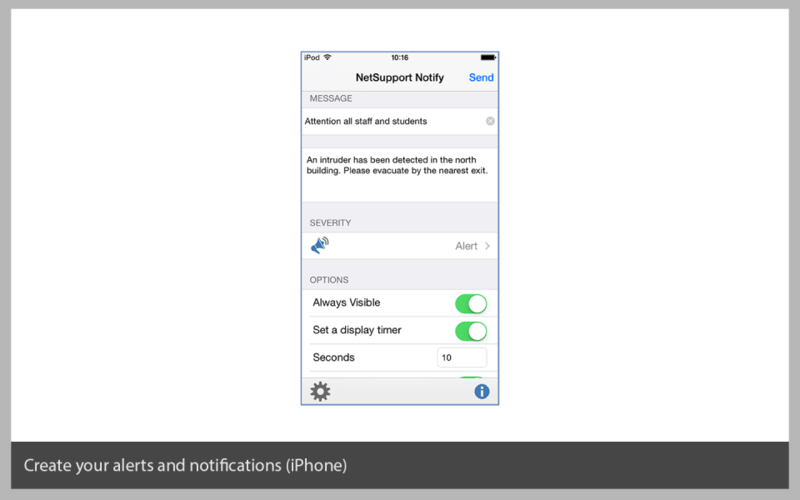 Great tool for getting important notifications right in front of staff when you need to. Pros: It's easy to setup and use. You can set up groups for notifications. Price. I would highly recommend the software. Pros: Customer support is very helpful. Account manager is readily available. Easy to install the software. Cons: We are running into some issues with NSS v11.2 and McAfee anti virus. It appears that some of the dlls are not signed. Overall: Instructors are able to easily connect with the classroom. Instructors and students are able to work collaboratively. This software has been awesome! It's saved us time having to call each department. -You can see when users close the notifications. Overall: When we had to get a notification out to each department we would have to call each department. 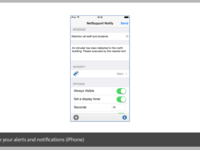 Now with netsupport notify I can send out a message to users in all the departments. Much more efficient! Such a cool product. We are implementing in our organization in 2018. Pros: The control you have... just overall. It's awesome to be able to see everyone's screen, lock down certain things, push things to them, etc. Pros: This product is great for getting messages out to the entire organization or specific departments. It is very easy to use and the history is nice to resend previous messages or track who sent what. Also it is a great price and easy to implement. Cons: I can't think of a con to this product. It does exactly what it is supposed to do notify users in a timely manner in a way that they will notice. Pros: besides ease of use, the tests we run are easy to do and are of short duration, thus not interrupting the operations of the office. So far, we have only tested it. We have not had to use it in a real situation. Cons: Hard to come up with a negative. It is easy to use and the messages are clear. People do not miss it unless they are away from their desks. Overall: An easy way to reach all our employees.